The pilot's seat beside Ann is empty! The helicopter is flying itself! Also, a funny detail about Chopshop is that apparently someone decided his pants legs (and only the legs) should be colored the same as his fur, making it look like he's in a speedo. Also someone cloned the Sergeant! His character model apparently recycled for nameless minor officers, with only Night of the Dark Kat bothering to try and give these guys somewhat different body builds and faces. For example, see the two in the cell with Feral when he's questioning Hard Drive. And in that shot we also see the return of three background characters from season one. The guy on the left with his hands on his hips was originally designed for The Giant Bacteria, but never appears in it. He does however appear in The Wrath of Dark Kat and The Metallikats, however. The fellow with the briefcase in the double-breasted suit is seen in The Giant Bacteria and in The Wrath of Dark Kat, although his suit was white in those episodes. The woman, meanwhile, was also designed for The Giant Bacteria but never appeared in it (AFAIK). I think she may be seen in The Wrath of Dark Kat and The Metallikats, but I can't be sure. Oh god what immediately came to mind was Who wears short shorts I have that on record somewhere now I have to play just for the hell of it. The truly bizarre thing is that's not some kind of coloring error Mook made, according to Chopshop's official model sheet. So either his flight suit's legs bellow the thigh straps are inexplicably colored the same as his fur... or he really is in what amount to booty shorts. 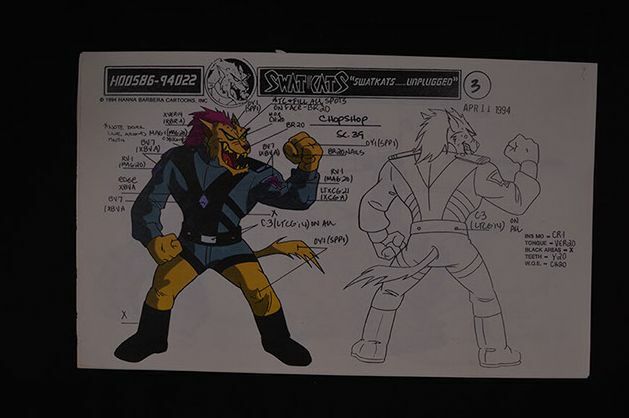 Also, apropos of nothing, but according to said model sheets, the original title was supposed to be "SWAT Kats... Unplugged." And it appears (unless the font is just smushing the T and K together) that they spelled it "SWATKats". And, as already pointed out, according to the notation the same color values are used. Looks like he is wearing shorts. I have had ear buds shock the inside of my ears, so I can confirm. It does indeed kinda hurt. 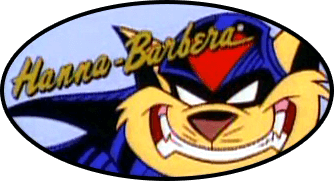 - The SWAT Kats are saying "Giving a taste of the real thing" when they are talking about Turboblades, only to fire Buzz-saw missiles..I know they're both for cutting, but still. - They establish that Chopshop's chopper has some kind of "mega alloy armor" by showing that the Buzz-saw missiles just bounce right off of it..only to have some kind of other missile penetrate it half a minute later anyway...The first time I saw this episode, I was expecting some kind of fancy new magnetic missile to grab onto it or something, but nah..
- I know the Turbokat's bomb bay was shown to fit stupidly many things inside it, but I feel they once again upped the ante in this episode with the full paint drum that was apparently just bouncing around inside it all this time. How convinient they just happened to have that paint drum INSIDE the Turbokat..."Full paint drum..don't leave base without it". Also, it's almost a bit creepy how that very first opening image resembles a real life event that happened years later..2 tall skyscraper towers, smoke coming out of one of them, they are referred to as "Megakat Trade Towers", the scene involves aircrafts..now if the radio call also said "There's been a 9-11 at MegaKat Trade Towers" instead of "There's been a 2-11 at MegaKat Trade Towers", that would be some really weird set of coincidences. I have a feeling a scene like that nowadays would just not fly. There are a number of pop culture instances in hindsight that appear seemingly prophetic after events (though this example is relatively minor). You should look into the pilot episode of The X-Files spin-off series The Lone Gunmen if you'd like to see another example of that. As to what a 2-11 is, I Googled it and it's police code for a robbery, meaning Chopshop stole something.